I made these hats for my cousin’s sweet twins for their newborn pictures (yes the same cousin I made the button wrap crochet boots for)! How it happened is she sent me this picture and asked if I could make the hat in the top right corner! So when it came time for this months Pinterest Challenge I knew JUST what I was going to do! Always up for a challenge (esp when it’s something cute!) I said SURE! After I finished the girls hat (yes I put my Baby boy in a girls hat for a picture- he looks REALLY happy about it, huh?) I thought we needed a boy version as well! I Love love LOVE how they turned out and I may or may not (but most likely I will) be making larger versions for my daughters birthday in April. Row 1: DC in 5th Chain from hook *CH 1, skip 1ch (DC-CH-DC) in next ch (V stitch made)*around, turn. Row 2: CH 3 (counts as DC) 5 DC in CH space, *SC in next CH-1 space, 6 DC in next CH-1 space (shell stitch made)* around, fasten off, but leave a good LONG tail for anchoring the flower. attach the flower or bow! Attach them wherever you think they look best! stuff the hat with stuffing, but not TOO full. weave row 3 of the underside into row 15 of the hat closing off the stuffing. If you want to have your hat on a band (I used lace elastic) leave a gap on each side as you weave the two pieces together to slide the elastic (or other material) through. Don’t forget to head over to Rebecca’s at Better Life Bags and link up YOUR pinterest inspired projects! Oh my gosh! THat is adorable! The baby is pretty adorable too. Can’t wait to hold him again. Thanks sweetie! I can’t wait to see you again myself! Ashlee!! Seriously you are amazing! I am loving all your crochet projects!! These hats are adorable! Thanks so much!!! It’s been a fun ride this time around, I’ve stuck with crocheting and knitting longer than I normally do on these kicks! Oh my goodness, I’m not sure which is cuter – the babies or the hats! Both made me smile. Thank you! Awwww thanks! I am still tickled by them myself! 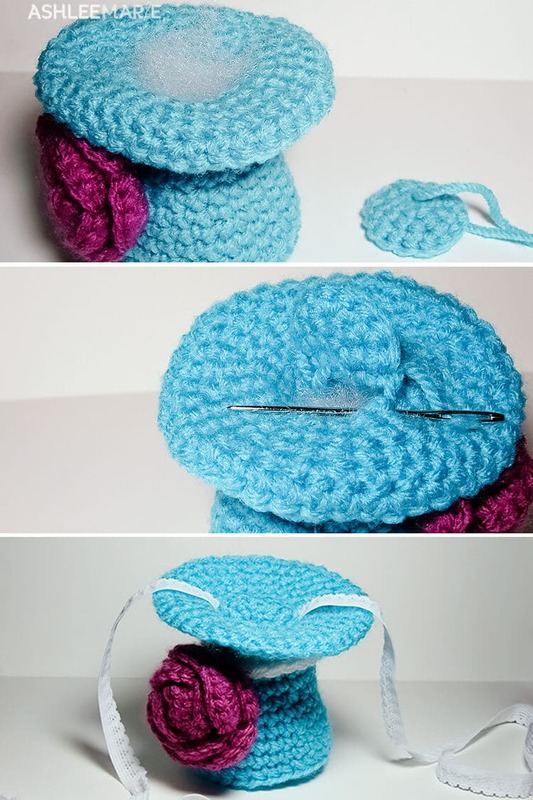 Love the idea to make a crochet one! I saw little headband hats at Buy Buy Baby last week and was going to do it with felt and fabric…but this is adorable!!! Thanks! Saw you at Sew Chatty! These hats are adorable ! Thanks! This is a pretty easy pattern too! 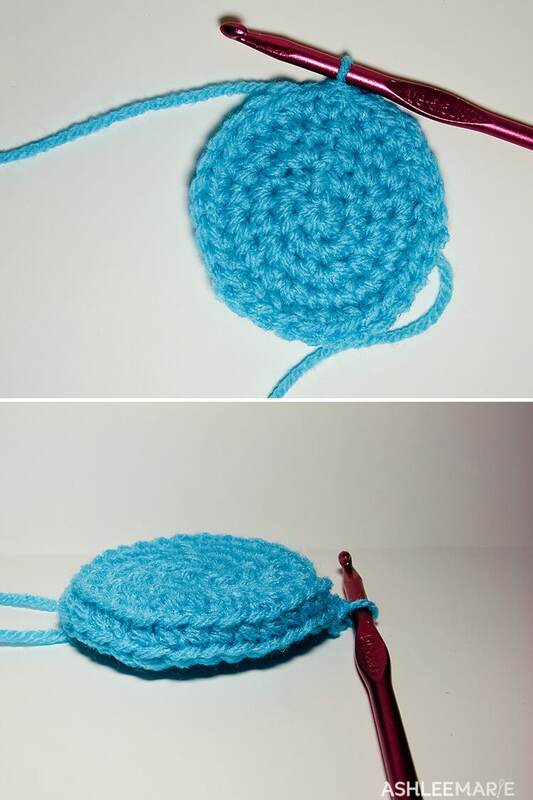 You should totally learn, there are so many fun things to crochet with! This is DARLING!!! Hope you can link it up at my turquoise lovin’ party!! Thanks so much! I’m sorry I missed your party! I try to get to comments earlier, but life gets in the way and I’m sometimes behind! Thanks for the invitation though! I’m glad you like my hat! Thanks!!! I love how they turned, out, def a current favorite of mine! It’s a pretty easy pattern and I hope you have an easy time making them! Putting the whole thing together is probably the trickiest part! Good luck and I hope you love it! Oh my word! These are some of the most adorable things I’ve ever seen. I am stopping by from Creations by Kara. I seriously just giggled my way through the photos. I just launched a link party over at my blog, and I’d love to have you link up with this post. So awesome! Thanks! My poor little guy is the model for so much these days! Luckily he doesn’t complain too often about it! And I linked up. OMG…these are just the cutest little hats ever:) The babies are just too adorable!!!! If I had a baby I’d definitely be making something like this! Eeek! thanks so much! I just LOVE how they turned out too! These are adorable. I want one for me! Thanks! I actually do have a larger pattern I’ll be sharing soon! Would you PRETTY PLEASE post this on my blog?? PLEASE?!?! Thanks so much for the complement! I actually used to link up to everything, but it took so much time away from my family that I now limit myself to 2 a day, but thank you for your interest. It’s actually a he, my baby boy is the model for both of these hat’s the twins they were made for are newborns! Oh Ashlee. You are just so talented!!! And the top hat just blows my mind!!! Thanks for sharing at oopsey daisy! your too cute! Thank you so much! I’m pretty excited about the larger version pattern I’m making for my daughters birthday party! I love it! He’s so cute and I shared it on my facebook page! Thanks for sharing! Hey, Ashlee, do you allow people to sell items made from your patterns? I’d love to make these for craft shows. (I don’t have an etsy shop or anything.) thanks. as long as you don’t sell my pattern I don’t have a problem with it. I personally don’t want to make and sell hundreds of them, but I know not everyone knows how to crochet and some people would like the ease of buying it. If someone asks please direct them to my free pattern, and thank you SO much for asking first, I really appreciate that! Love!!!! Thank you for posting! I did change it up a bit to stand up to my 9 year old 🙂 by crocheting in tge front post stitches when moving onto the brim. I also did a sl st in each st around the last row of the brim to get it to lay flatter. <3 thanks again!!!! your so welcome! I’m saving the larger version post for closer to my daughters birthday since that’s what I’m making them for, but in then next 5 week! Do you not chain any at all before the rounds? thanks for your note! I fixed the pattern. YES, I ch1 before every row… Sorry! 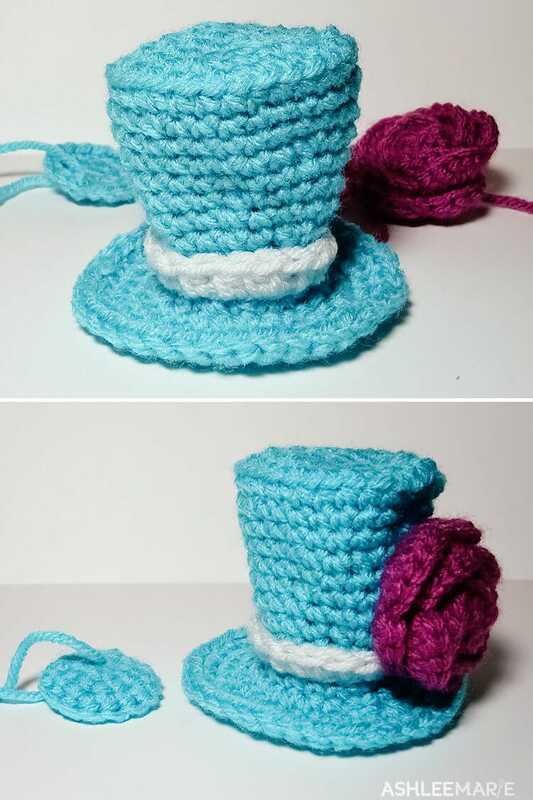 Hi, I am making the tiny top hat and i would like to know how the elastic band is connected? Did you sew the band together and hid it under the underside of hat? Or did you just tie a knot at the back. How many inches did you use of elastic? I don’t have a baby so it’s hard for me to measure. i’m giving as a gift. Thanks i love this pattern you did a great job. when I added the bottom with the sl st I skipped two stitches on each side to leave two openings, I then slid the elastic through, cut it long and tied it with a knot so my cousin (customer) could change the size. If I was doing it for my own little guy I’d sew it at the right size, but for a gift I didn’t want it to be too big or two small! I hope that helps, I don’t remember how big I made the elastic, I measure it against my babies head! 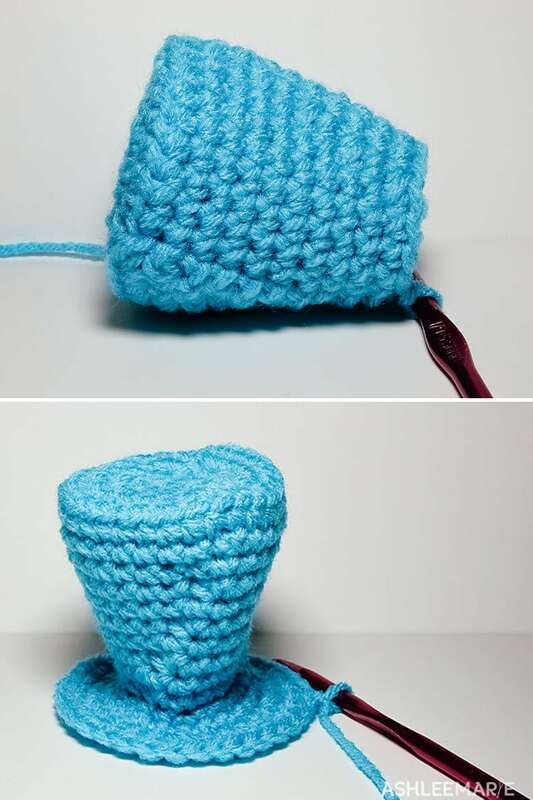 Wow, this is just adorable, I totally envy your crocheting talent and creativity! 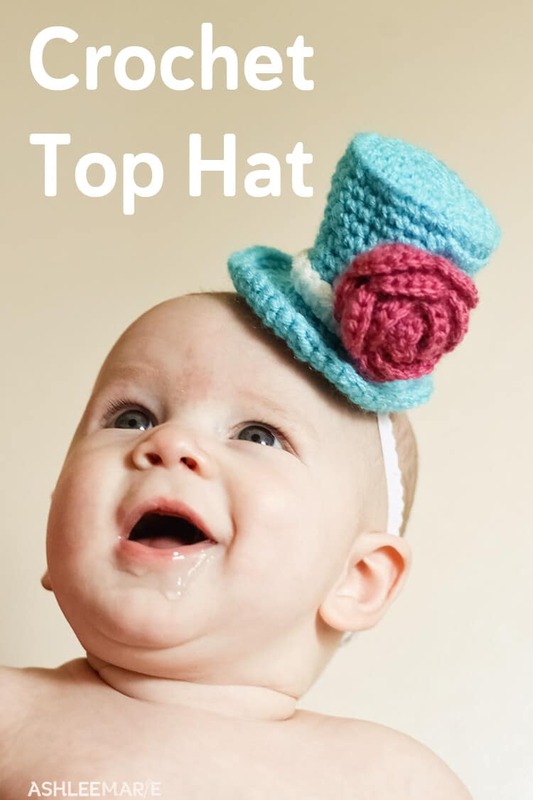 I wanted a top hat so bad when my son was born so I tried so hard to make one but it never turned out right, too bad I never found this site back then! But I will be making your boots and sandals for my girl coming in september! It felt like christmas when I found all these adorable free patterns!!! 😀 you are just awesome. your so welcome! I have a larger hat too, I need to add the pattern for that one as well! I know we all have different styles so not all patterns work for everyone, but I love creating them! your so welcome! let me know how it goes! for sharing some really cute patterns!!! I love finding people who are truly talented; and you are! Thank you so much!!! I hope you enjoy making them! This is fantastic! I just worked one up and I love it :). Thank you for the pattern!! I added an extra row at the end. I worked a crab stitch in each sc around and I think it added a nice effect like that little lip around the edges of top hats. Just a suggestion :). Thanks again!! I’m glad you like them. feel free to change it however you want for personal use! Thank you for posting all of your free patterns! I am getting back into crochet so I appreciate having accessible guidelines that I can use while learning the ropes. I made mine into a wee little leprechaun hat for this upcoming spring! cute!!! 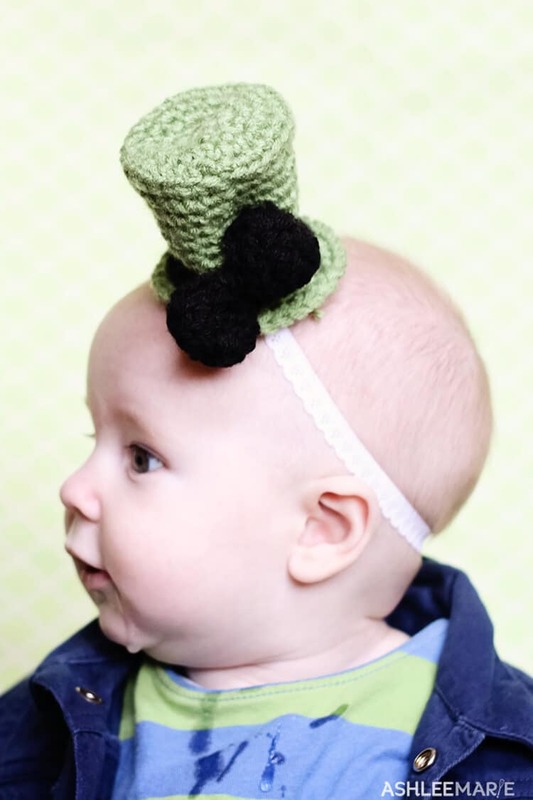 I made a leprechaun hat last year for Baby Boy, so precious! OMGosh!! My friend is going to DIE when I send this to her for the birth of her 3rd child (2nd girl). SO awesome!! Love the Top Hat… Am curious to know if you have posted the larger pattern yet??? no, I never did and now I can’t find the pattern (I hand wrote it on some piece of scratch paper, I’m awesome like that…). Thanks for the reminder, I’ll look into re-writing it. What an awesome hat! I’ve always wanted to take up crochet and this is the sort of thing that inspires me. I’d love to make something like this for my niece who is really into dressup – she is 2 this month. How would I go about altering the pattern to fit? I use this size for newborns to toddlers, I only made one more size, that fit my 5 year old, 11 year old and me. So glad I found this. We are having hat day at the end of the month and I think this fits perfectly. So adorable. It’s perfect for the preschool I work at. Thanks for sharing! I did a St Patricks day one as well a few years ago! Fun huh? Absolutely 🙂 my little man looked so adorable and surprisingly, he actually kept it on for a pretty good while. It’s always a fun surprise when they keep them on!!! My baby didn’t love the top hats, but he left his huge Lorax mustache on from halloween 2 years ago, totally didn’t expect that! you are so welcome! this is one of my favorites! I still need to add the larger size, gah, it’s amazing how much I have done and just don’t have the time to post! I am having a really hard time with the bow. When you say “sc in the same ch” or “sc in the same sc”, what does that mean? The same chain as what?